A lot of users have never used Task Manager or have never even heard about it. Aside from all the cryptic information Task Manager gives you, it does allow you to kill an application or process that is frozen or unresponsive. The Task Manager is nice, but what if you're the type of user that really likes to know what's going on behind the scenes of every program and service currently running on your system? 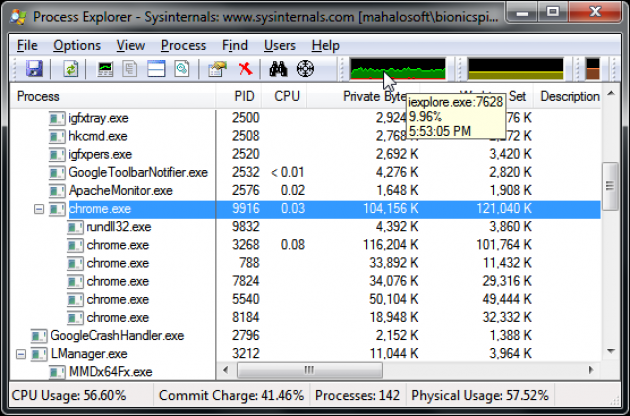 ProcessExplorer (download here), a free utility, is basically the Task Manager on steroids. It does everything that Task Manager can do and a whole lot more. It documents detailed information about running processes, such as security attributes, its icon, user account information, file and DLL usage, and a lot of other data that any software author or computer geek would love to know. Let's give ProcessExplorer a test drive, shall we? ProcessExplorer doesn't need to be installed. It comes in a zip file and can be run as soon as it's unzipped. Upon first glance, your eyes may glaze over at the wealth of information ProcessExplorer puts before you. It's a little intimidating at first. There are graphs, a process tree, and columns with strange names like PID and Working Set. The graphs at the top of the utility are interesting. Hover your mouse pointer over them to get a tool-tip that tells you exactly what the graph is keeping track of. For example, the orange graph gives you data on physical memory. One of the cool things about this utility is that it shows you each process's icon when it's listed on the left window pane, which makes it easier to pick out a process from a myriad of them. Double-clicking on a process brings up a very detailed properties dialog box with very technical information. For example, the "Performance" tab lists data pertaining to CPU, memory, and virtual memory usage. The "Performance Graph" tab gives you a nice animated visual on any process's CPU usage. A lot of the technical jargon used on the properties dialog box comes from programming lingo, so don't despair if you don't get it at first. The help manual is very useful, and it's advised that you take a look at it so that you actually know what you're looking at when you run ProcessExplorer for the first time. If you've ever been curious about what an application is actually doing when it's running, then ProcessExplorer is the utility for you. It gives you very detailed information about everything that's running on your system. Ever want to know which DLL's (dynamically linked libraries) a certain program has loaded? Or what a certain program's security attributes are? Or how much virtual and physical memory an application is using? ProcessExplorer does all this and much more.